Most real world circuits are not pure series or pure parallel but are a combination to the two. Figure 3 shows a typical circuit that has both series and parallel components. After leaving the negative terminal of the battery, all current must flow through resistor R1. This is the series portion of the circuit. After exiting R1, the current has two possible paths: R2 or R3. This is the parallel portion. 1/Requiv = 1/R2 + 1/R3 = 1/(10 Ω) + 1/(5 Ω) = 3/(10 Ω) therefore Requiv = 3⅓ ohms. 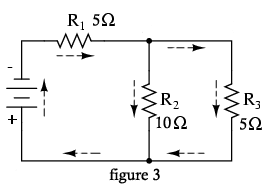 The circuit has now been reduced to the series only circuit shown in figure 4. 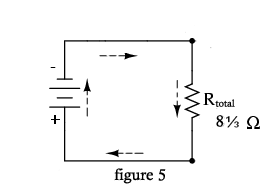 The next step is to use the series formula for resistance to determine the total resistance of the circuit. Rtotal = R1 + Requiv = 5 Ω + 3⅓ Ω = 8⅓ ohms. 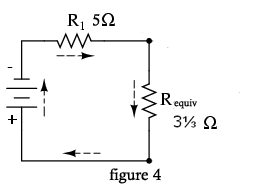 You now have reduced the circuit to a single resistance as shown in figure 5.